This method was presented by Robert M. Eisberg in his 1976 calculator programming book (see source below). C: d^2y/dt^2. Represent dy/dt as the variable A, y as the variable Y, and t as the variable T.
The program will always designate Y as the independent variable and T as the dependent variable. Input: C. Use single quotes to enclose d^2y/dt^2. Represent dy/dt as A, y as Y, and t as T.
Output: A matrix of two columns, t and y. Input: For C, use enclose d^2y/dt^2 in quotes. Represent dy/dt as A, y as Y, and t as T.
Please see the screen shots below. Both are screen shots from the TI-84 Plus. The classic fx-7400g (we’re talking about the early 2000s) lacked numerical integration, summation, and polar graphing. Let’s remedy that through programming. 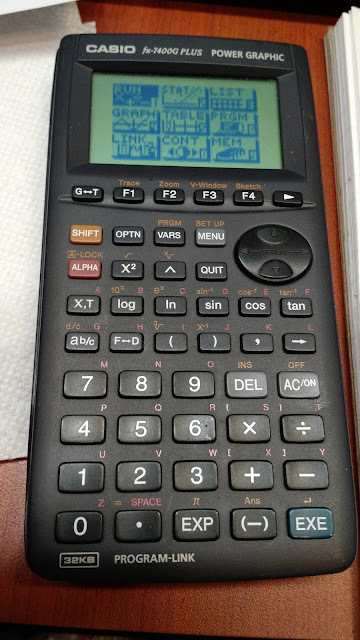 Fortunately any of the programs created on the fx-7400g Plus can be translated literally to later Casio graphing calculators. * This is best used when the function list is clear. * Set up graph screen parameters (Xmin, Xmax, Ymin, Ymax) before hand. * Insert polar functions by editing the 7th line (in italics), using I for θ. The result must be stored to R (by → R). The programs SUMFX and INTFX will require the subroutine program FX. FX is where you insert the function f(x). The result is stored to Y. The program BINOMEXP shows the coefficients of the binomial expansion (Ax + B)^N. The program FORDINT calculates the third point on a triangle where the coordinates of points A (xa, xb) and B (xb, yb) are known. Also, a line towards P point is aimed from point A at angle α° and from point B at angle β°. TRAVEZ calculates the new point knowing the original coordinates, direction, and angle of travel. The angle 0° comes from due east and rotates counterclockwise. Yes, I just can’t resist. The calculator feels pretty good to hold, it is lightweight. The fx-7400g Plus is a simplified version of fx-9850g family, marketed as entry level graphing calculator. The features have been scaled down. As a result the fx-7400g Plus lacks matrices, distribution functions, numerical integral, and polar graphing. For statistics, the fx-7400g offers the following regressions: linear, med-med, quadratic, logarithmic, exponential, and power. Instead of the usual six function keys (F1 – F6), the fx-7400g Plus has four function keys, with two of them replaced with [ G<>T ] (graph-table switch) and [ > ] (next menu page). I don’t know if the [G<>T] key is used today, but it is used two switch between the graph and home screen. Today, the command only works when the current Casio graphing calculators (like the Prizm fx-CG 10) is in the Linear Input/Output mode. When a program is executed, the calculator is returned to the Run mode rather than stay in Program mode. Exit program execution by pressing [AC/ON]. When Program Mode is entered, all the programs are listed chronically (when they first created). There is no option to sort the programs alphabetically. The fx-7400g handles calculations pretty quickly. The programming command set on the fx-7400g Plus may be scaled down, but most of the commands we expect on the Casio Graphing calculators are present. The lack of matrices, complex numbers, and a simplified list command set does provide a challenge, but we should be able to program for a lot of applications. To get the quotes ( “ “ ), press [ALPHA] then [ F2 ]. This is the only way to get the quotation marks. I will present programs on next blog entry. The fx-7400g Plus is not a bad entry-level calculator. 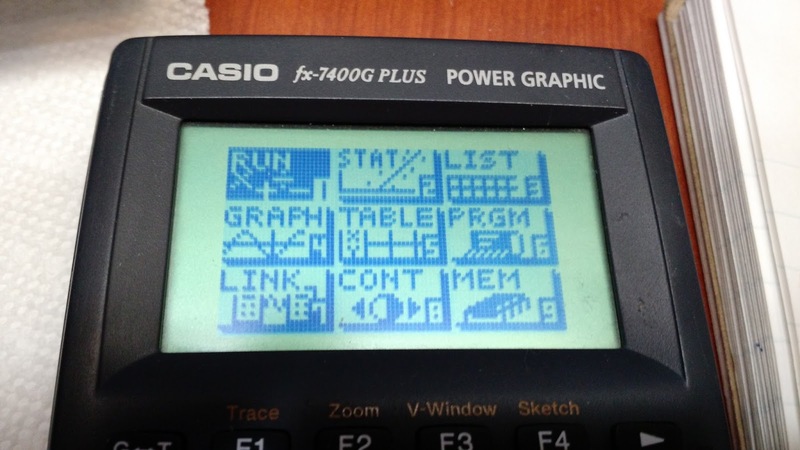 The early version is more an old-school graphing calculator. The 2016 United States Elections still fresh on the minds of some Americans, even with talk of repealing the Electoral College. But how does the Electoral College work? Each of the 50 states receives a set amount of electoral votes, which is based on the number of House Representatives and Senate members. Each state gets two Senators. The number of House Representatives is determined by popular. Every ten years, specifically 1990, 2000, 2010, 2020, and so on, the United States takes nationwide census. That population becomes the basis of determining the number of House of Representatives. Currently, there are 435 members of the House. After the election, each state gives the set number of electoral votes to the candidate who wins the popular vote in that state. For example, California, where I’m from, has 55 electoral votes. If Candidate A wins by popular vote in California, that candidate gets 55 votes. The exceptions are Maine and Nebraska, which use a congressional district method. Note: In the Electoral College, 3 additional votes goes to the District of Columbia. However, since D.C. is not a state, it won’t get seats in the House of Representatives. In order to represent the population as fair as possible, methods must be used to distribute the number of seats. The method currently used is the Method of Equal Proportions, which has been in use since 1940. The first step is to give each state one seat at the House of Representatives. For the United States, after each state gets one seat, there are 385 seats to assign. As the first step, each state gets 1 seat. That means there are 19 seats remaining. (24 - 5) I am going to use the recursive definition. We need to adjust the population (to determine the priority number) by dividing each population by √2. Note: calculations in this example are rounded to the nearest integer. Seat #7, goes to Andromeda, because Andromeda now has the largest adjusted population at 76,014. Adjusting the population: 76,014 * √(1/3) = 43,887, and Andromeda gets another seat. Final Distribution for Celestia (our example): Virgo, 7 House seats, Andromeda, 5 House seats, Orion, Sagittarius, and Pegasus get 4 each. The program EQPROP takes two arguments: the list of populations, and the number of House of Representative seats to be assigned. The program assumes that two Senators will also be assigned. Column 1: The population of each state. The population is sorted in descending order. Column 2: The number of House Representatives. Column 3: The number of House Representatives plus the 2 senators. For the TI-84 Plus: L1 is used as the population list, lists L2, L3, and L4 are used for calculations, and the results are returned in Matrix [A].